When I was maybe ten years old, I sat down in front of a beige box and played a game called Humbug. It was my first foray into the world of text adventure games, and it was a strange feeling. As a kid who was used to escaping into other worlds through books and video games, playing a text adventure was a combination of two things I held dear, a dichotomy-smashing experience that I didn’t know was possible until that point. Sure, games required some reading, but this was different. Like in a book, I had to let my imagination shape text into settings, characters, and items instead of having those things presented to me through polygons, yet I was still playing—exploring on my own and making things happen through my choices and actions. It’s a memory that sticks out in my mind, so when I played No Code’s new game The House Abandon, I was immediately brought back to that moment when I booted up Humbug for the first time, nostalgia in full force. No Code is a small studio backed by a big name. It’s run by Jon McKellan, who’s no stranger to either horror or nostalgia. 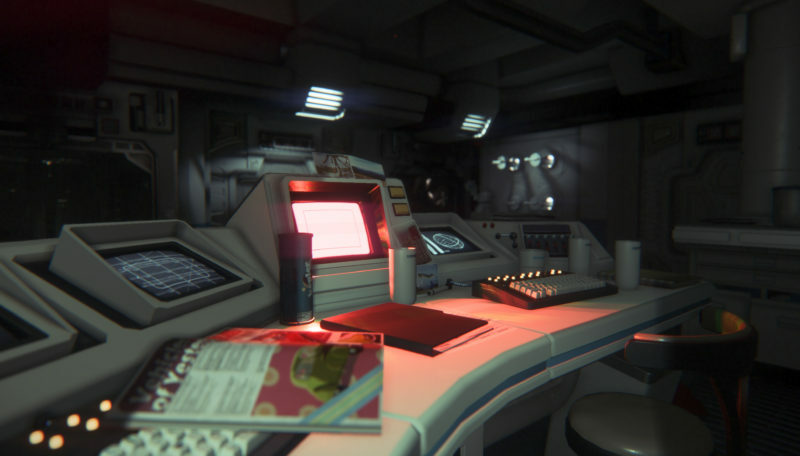 He worked as a designer on Alien: Isolation (pictured below), which featured a raw 1970s vision of sci-fi horror that tried—and succeeded—to stay true to Ridley Scott’s direction in the first Alien film. McKellan and his team at No Code created The House Abandon back in August as part of the Ludum Dare #36 game jam, a competition in which developers are challenged to create a game fitting a predetermined theme in just three days. No Code’s theme was “Ancient Tech,” and they went meta with it. 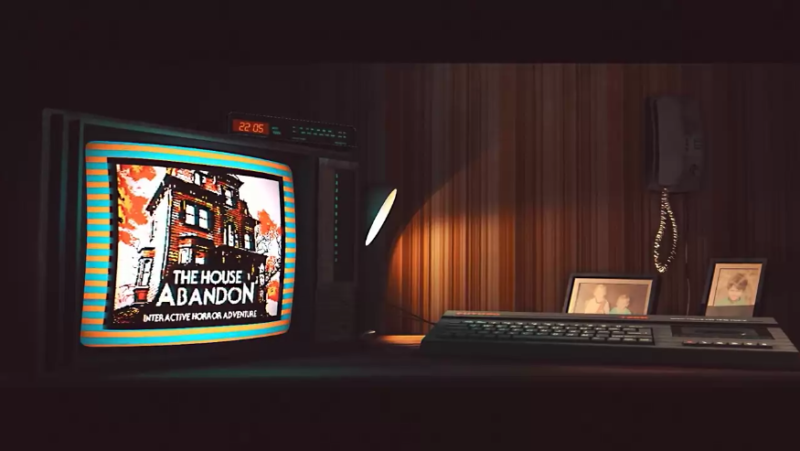 The House Abandon‘s defining feature is a machine inspired by the 8-bit giants of the past like the Commodore 64, ZX Spectrum, and Amstrad CPC. 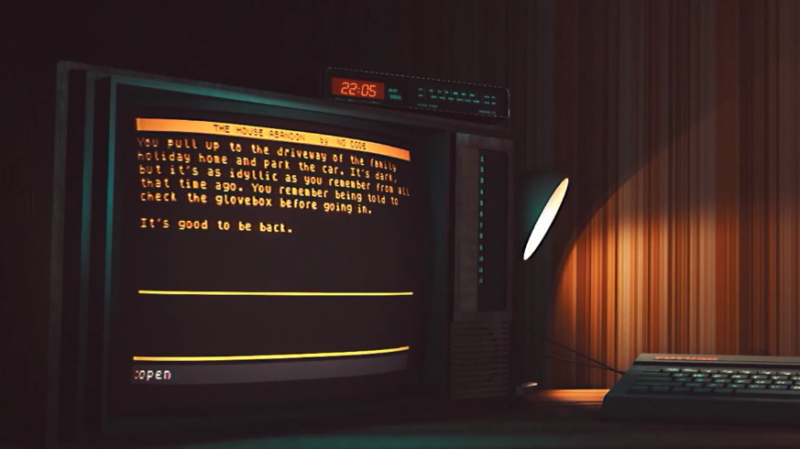 You sit in a room with the retro PC in front of you, the introductory words of a text adventure game—also titled The House Abandon—on the screen. As you play the game within a game, dread spreads out of the confines of the screen into the room around you, physically warping and changing things as you uncover the titular house’s shocking truth. “Ancient Tech” is an apt theme these days. Nostalgia seems to permeate all corners of entertainment, which might be most apparent by the widespread success of Stranger Things. Everybody’s favorite Netflix binge is the obvious comparison for The House Abandon, and I couldn’t help but find myself thinking of it as I played, but not just because it takes place in the same time period or has a similar atmosphere. The House Abandon accomplished the same feat that Stranger Things did in its pilot episode: it established an irresistible world. Horror games often branch out from a single, small-scale idea, and The House Abandon basically is that idea. It’s a taste of something from which a larger world could easily expand. Like all good stories, it asks a simple question: What if a text adventure game could change the world around you as you play? No Code only had three days to answer that question, but I would love to see what the result would have been if they’d had more time. Horror developers in both film and games are increasingly finding new areas of our psyche to explore. In the ’80s and ’90s, horror often focused on a singular being or entity who was out to get the main characters (e.g. Jason, Freddy, the Xenomorph). You usually saw them multiple times throughout the film, and the implications of being caught by them were clear. Sometimes, they even had backstories which often served to explain their weaknesses and instill hope for a possible defeat. Now, horror tends more toward an overarching sense of dread. While the characters might still be running from something, we rarely get a feeling of relief from the oppressive stakes. In movies like It Follows and The Babadook, the entity is unexplainable and all-encompassing. Even when the characters are at rest, the idea of it is always there, lurking in the background. Stranger Things felt a bit like that with the Upside Down seeping into the real world, and The House Abandon feels a bit like that with the game seeping into the real world. The House Abandon leaves most of its horror up to the player’s imagination, and the most sinister parts of the game, for me, were the moments when I was reading something in the text rather than when something was physically happening to the room around me. Whether they fall within the horror genre or not, text adventures are slightly unsettling by their very nature. An atmosphere isn’t immediately defined or clearly laid out for you, so you’re never really sure what to expect, and a single word can elicit a myriad of responses. The House Abandon runs with that idea and successfully delivers on it. It’s a prototype, so it’s possible to run into bugs, although I didn’t. The only issue I did run into was that some seemingly obvious text commands don’t work, but it’s not too difficult to work around that and figure out where the game is leading you. If anything, it adds some challenge to a game that’s heavy on narrative and light on gameplay. This may seem like a lot to say for a game that only lasts 30 minutes, but The House Abandon is a cohesive package that accomplished more in 30 minutes than some games have over the course of hours. I’m not sure if it will ever happen, but I’d really like to see a full version of this game, or at least something like it. I’m excited to see what else No Code are up to, but I wouldn’t mind if they made an extended version of The House Abandon a priority. I wouldn’t even mind if it ended the same way. I just want to know more about that house, and the game within the game. You can download The House Abandon for free! Then, if you’re like me and want to follow No Code’s every move from now on, follow their development blog for updates.